amTopo by Apogee Mapping, Inc.
amTopo is a unique offering of 7.5 Minute (1:24,000 scale) and 15 Minute (1:48,000 scale) topographic maps with a modern look and highly detailed, updated content. While geographic coverage remains identical to existing United States Geological Survey (USGS) topographic maps, amTopo maps have been completely updated using information from dozens of public agencies. Aerial imagery has been used to correct and add locations of roads, trails, and recreational facilities, and color hillshading has been added to enhance terrain features making maps easier to read while in the field. Numerous amTopo maps may be purchased featuring our alternative greyscale hillshading, which includes the pale green woodland tint (tree cover) layer depicted on older USGS maps. 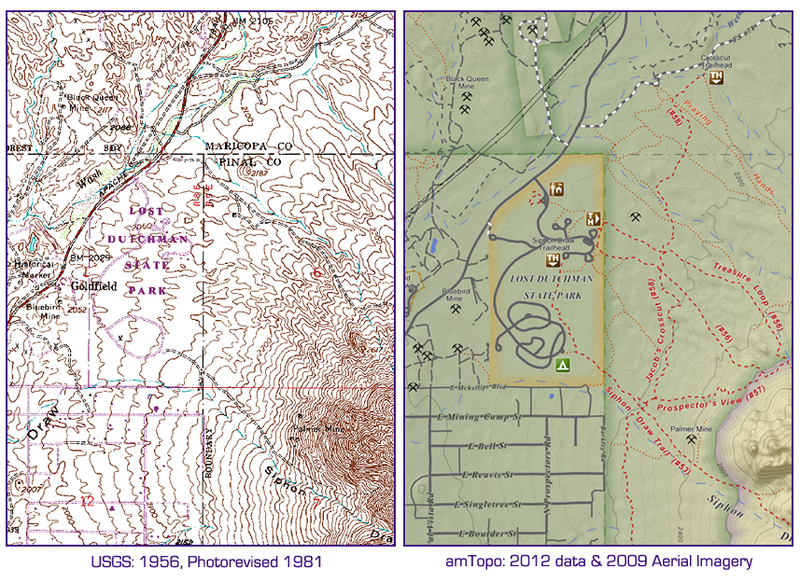 amTopo maps have been thoughtfully designed with navigation in mind. Each map includes essential elements for determining one’s precise location. We provide 40-foot contour lines for our 7.5 Minute map series, and 80-foot contour lines for our 15 Minute map series. We also include UTM and Latitude/Longitude grid marks, a 360-degree compass rose depicting true north, and updated local declination values for magnetic north. These features, combined with our enhanced hillshading, will assist adventurers with matching features in the field to elements on a given amTopo map. A simple, easy-to-read scale bar and legend is provided on all maps, with additional LEGEND INFORMATION available online. 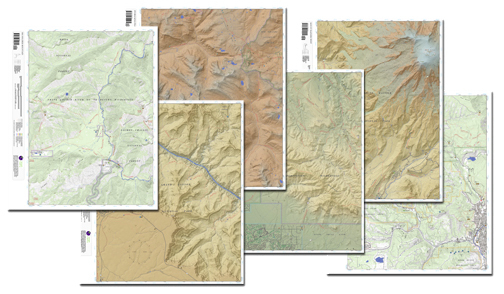 amTopo maps can be printed on standard paper, or on waterproof, tear-resistant paper. All maps are carefully rolled and shipped in durable mailing tubes. 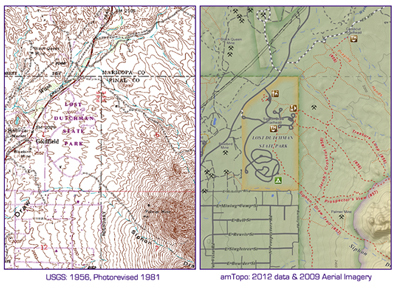 Comparison of an original USGS map quadrangle with an equivalent amTopo map quadrangle.